Fmulder found a cool photo gallery/tour of the Blizzard offices, posted by Games Radar. The pictures are all ones they took during last week’s media event, and they depict cool artwork and decorations from all of Blizzard’s game worlds, as well as pictures of the library and some other stuff. Check out the whole Games Radar photo gallery, since it’s worth a look. The five pics showing Diablo stuff have been added to our extensive gallery of photos from Blizzard’s offices, and you can see them thumbed below. 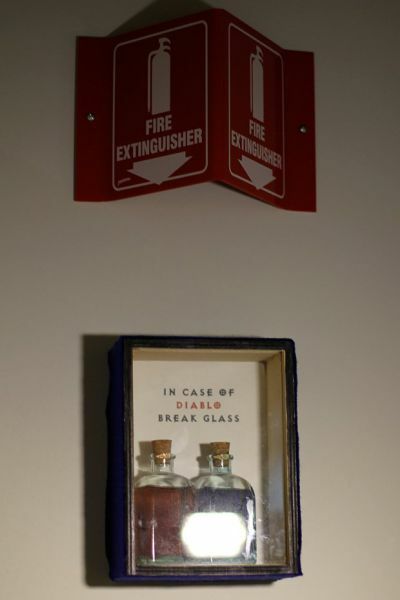 I like that Diablo extinguisher shot, but shouldn’t there be a sword in that case too? Or at least a soulstone?